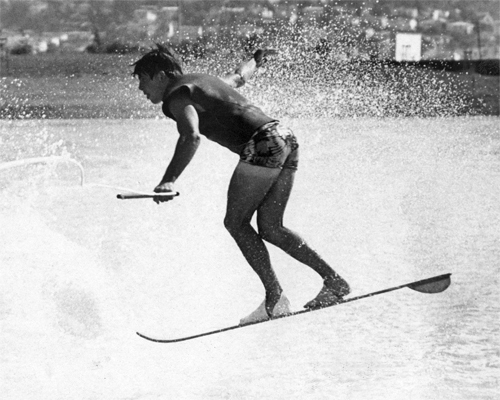 Mike Murphy was not the first person known to consistently perform a wake 360 turn on a slalom ski. That honor belongs Butch Peterson (The Water Skier. May, 1968) Mike had Butch’s move down a year later, adding it to tricks like the backwards deepwater start and backwards landing. In the mid 1970s Mike invented the slalom ski tumbleturn, and his repertoire of tricks catapulted him to skiing fame as the first rider known primarily as a hot dog skier.